I've definitely made a serious transition in my photography career. Last year at this time I was in Ireland shooting the PSU/UCF game, having a blast & COMPLETELY outside of my comfort zone.. I kept photographing games throughout the season and found that I loved everything about shooting football, well... except biking 2 miles with all my gear wrapped around me like a pack mule... I wish I had a picture of THAT! As I grew as a photographer and realized I had a heart for small business and the personal relationships I was able to build with clients. So I decided to take my career in a totally different direction. 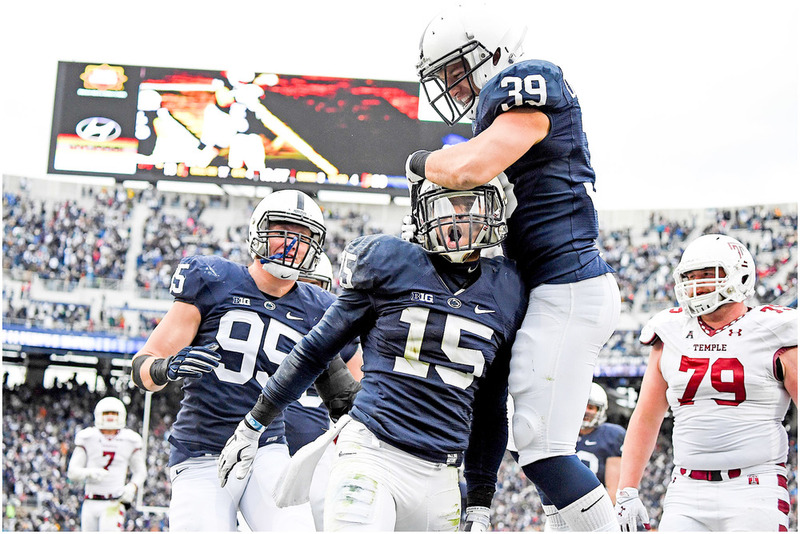 But that doesn't take away from how much fun I had shooting football and countless other stories in Happy Valley! I think this is what really shaped me as a photographer and makes my work unique. People are drawn to images that capture a moment in time and that's what football really taught me. PS - All the captions automatically appeared with each image. Had a little chuckle to myself remembering what it's like to caption every single image that's published... Definitely don't miss that! I'm so glad you stopped by! Keep scrolling to find out what I've been up to lately! You'll find recent wedding stories, engagement adventures, tips + tricks and travel posts! Consider yourself a friend around here! Something pique your interest? Don't hesitate to get in touch! Sign up for our newsletter + receive 8 epic travel photos right to your inbox! Type "TIPS!" into the Search Bar to find great information about the wedding process!